Did you know, sweat trapped in your underarms feeds bacteria to cause 90% of body odour? *To stop body odour at its source, you need Rexona '" the World's No. 1 Deodorant! 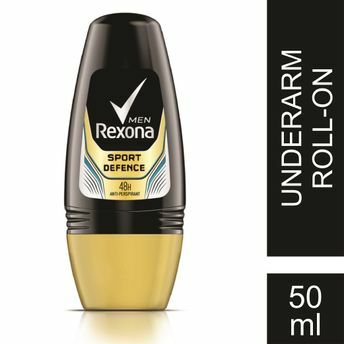 Rexona Underarm Roll-On acts on underarm sweat where bacteria thrive, to keep you smelling clean and protected from odour all day!It has Sweatguard technology which prevents odour from sweat + bacteria. Rexona Sport Defence Underarm odour protection Roll-On is an ideal solution for the busy man in the hot outdoors! Rexona's Dry Shield Guard protects you throughout the day from sweat and odour giving you the confidence to do more. The sporty fragrance will keep you feeling active and fresh! Whether you're scaling a mountain, running for the bus or train, presenting to your boss or going for your first job interview, you can be confident of the best Protection.